Ultrasonic mixing and dispersion activates and intensifies the catalytic reaction in fixed bed reactors. The sonication improves the mass transfer and increases thereby efficiency, conversion rate and yield. An additional benefit is the removal of passivating fouling layers from the catalyst particles by ultrasonic cavitation. 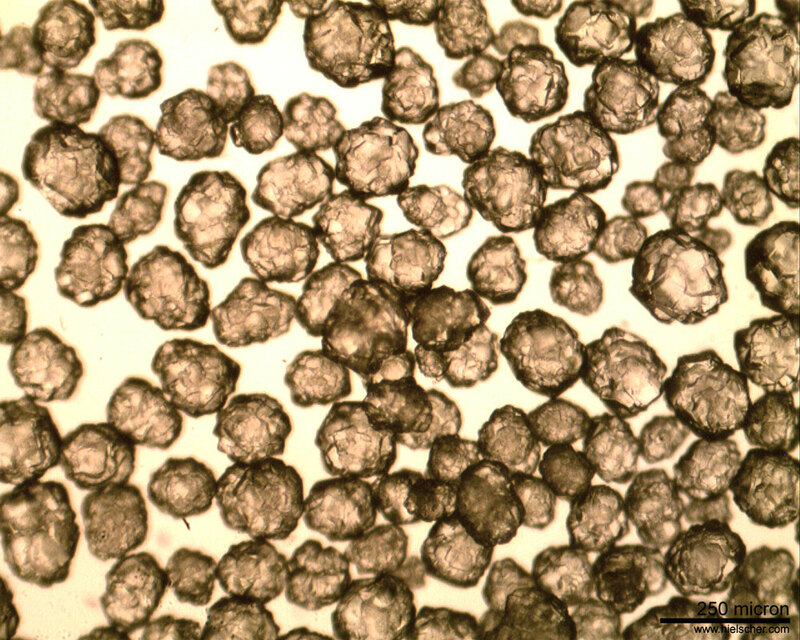 Fixed beds (sometimes also called packed bed) are commonly loaded with catalyst pellets, which are usually granules with diameters from 1-5mm. They can be loaded into the reactor in form of as a single bed, as separate shells, or in tubes. The catalysts are mostly based on metals such as nickel, copper, osmium, platinum, and rhodium. The effects of power ultrasound on heterogeneous chemical reactions are well known and widely used for industrial catalytic processes. Catalytic reactions in a fixed bed reactor can benefit from ultrasonic treatment, too. Ultrasonic irradiation of the fixed bed catalyst generates highly reactive surfaces, increases the mass transport between liquid phase (reactants) and catalyst, and removes passivating coatings (e.g. oxide layers) from the surface. Ultrasonic fragmentation of brittle materials increases the surface areas und contributes thereby to an increased activity. Ultrasonic mixing and agitation improves the contact between reactant and catalyst particles, creates highly reactive surfaces and initiates and/or enhances the chemical reaction. Ultrasonic catalyst preparation can cause changes in crystallization behavior, dispersion / deagglomeration and surface properties. Furthermore, the characteristics of pre-formed catalysts can be influenced by removing passivating surface layers, better dispersion, increasing mass transfer. Click here to learn more about the ultrasonic effects on chemical reactions (sonochemistry)! Solid catalysts in fixed bed reactors are mostly in form of sherical beads or cylindrical tubes. During the chemical reaction, the catalyst surface is passivated by a fouling layer causing loss of catalytic activity and/or selectivity over time. Time scales for catalyst decay vary considerably. Whilst for instance catalyst mortality of a cracking catalyst may be occur within seconds, an iron catalyst used in ammonia synthesis may last for 5–10 years. However, catalyst deactivation can be observed for all catalysts. Whilst various mechanisms (e.g. chemical, mechanical, thermal) of catalyst deactivation can be observed, fouling is one of the most frequent types of catalyst decay. Fouling refers to the physical deposition of species from the fluid phase onto the surface and in the pores of the catalyst blocking thereby the reactive sites. Catalyst fouling with coke and carbon is a rapid occurring process and and can be reversed by regeneration (e.g. ultrasonic treatment). Ultrasonic cavitation is a successful method to remove passivating fouling layers from the catalyst’s surface. 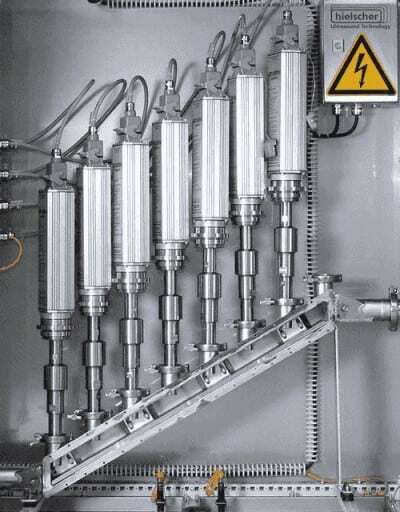 The ultrasonic catalyst recovery is typically carried out by sonicating the particles in a liquid (e.g. deionized water) to remove the fouling residues (e.g. platinum/ silica fibre pt/SF, nickel catalysts). Hielscher Ultrasonics offers various ultrasonic processors and variations for the integration of power ultrasound into fixed bed reactors. 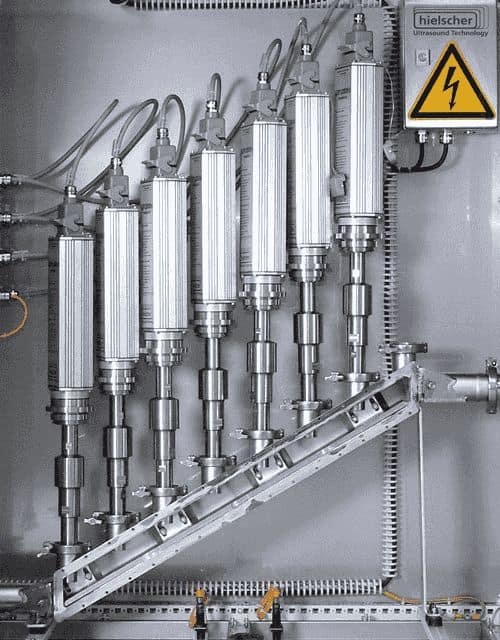 Various ultrasonic systems are available to be installed into fixed bed reactors. 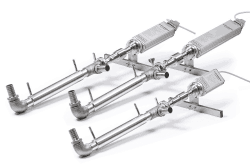 For more complex reactor types, we offer customized ultrasonic solutions. To test your chemical reaction under ultrasonic radiation, you are welcome to visit our ultrasonic process lab and technical center in Teltow! Contact us today! We are glad to discuss the ultrasonic intensification of your chemical process with you! Argyle, M.D. ; Bartholomew, C.H. (2015): Heterogeneous Catalyst Deactivation and Regeneration: A Review. Catalysts 2015, 5, 145-269. Oza, R.; Patel, S. (2012): Recovery of Nickel from Spent Ni/Al2O3 Catalysts using Acid Leaching, Chelation and Ultrasonication. Research Journal of Recent Sciences Vol. 1; 2012. 434-443. Sana, S.; Rajanna, K.Ch. ; Reddy, K.R. ; Bhooshan, M.; Venkateswarlu, M.; Kumar, M.S. ; Uppalaiah, K. (2012): Ultrasonically Assisted Regioselective Nitration of Aromatic Compounds in Presence of Certain Group V and VI Metal Salts. Green and Sustainable Chemistry, 2012, 2, 97-111. Suslick, K. S.; Skrabalak, S. E. (2008): “Sonocatalysis” In: Handbook of Heterogeneous Catalysis, vol. 4; Ertl, G.; Knözinger, H.; Schüth, F.; Weitkamp, J., (Eds.). Wiley-VCH: Weinheim, 2008. 2006-2017. Coupling power ultrasound into liquids an slurries results in acoustic cavitation. Acoustic cavitation refers to the phenomenon of the rapid formation, growth, and implosive collapse of vapor filled voids. This generates very short-lived “hot spots” with extreme temperature peaks of up to 5000K, very high heating / cooling rates of above 109Ks-1, and pressures of 1000atm with respective differentials – all within nanosecond lifetime. The research field of sonochemistry investigates the effect of ultrasound in forming acoustic cavitation in liquids, which initiates and/or enhances the chemical activity in a solution. In chemistry, heterogeneous catalysis refers to the type of catalytic reaction where the phases of the catalyst and the reactants differ from each other. In context of heterogeneous chemistry, phase is not only used to distinguish between solid, liquid, and gas, but it refers also to immiscible liquids, e.g. oil and water. During a heterogeneous reaction, one or more reactants undergo a chemical change at an interface, e.g. on the surface of a solid catalyst. Reaction rate is depending on the concentration of reactants, the particle size, temperature, catalyst and further factors. Reactant concentration: In general, an increase of concentration of a reactant increases the rate of reaction due to the larger interface and thereby greater phase transfer between reactant particles. Particle size: When one of the reactants is a solid particle, then it cannot be displayed in the rate equation, as the rate equation only shows concentrations and solids cannot have a concentration since being in a different phase. However, the particle size of the solid affects the reaction rate due to the available surface area for phase transfer. Where Ea is the activation energy, R is the universal gas constant and T is the absolute temperature in Kelvin. A is the Arrhenius (frequency) factor. e-Ea/RT gives the number of particles under the curve that have energy greater then the activation energy, Ea. Catalyst: In most cases, reactions occur faster with a catalyst because they require less activation energy. Heterogeneous catalysts provide a template surface at which reaction occurs, whilst homogeneous catalysts form intermediate products that release the catalyst during a subsequent step of the mechanism. Other factors: Other factors such as light can affect certain reactions (photochemistry). Nucleophilic substitution is a fundamental class of reactions in organic (and inorganic) chemistry, in which a nucleophile selectively bonds in form of a Lewis base (as electron pair donator) with an organic complex with or attacks the positive or partially positive (+ve)charge of an atom or a group of atoms to replace a leaving group. The positive or partially positive atom, which is the electron pair acceptor, is called an electrophile. The whole molecular entity of the electrophile and the leaving group is usually called the substrate. The nucleophilic substitution can be observed as two different pathways – the SN1 and SN2 reaction. Which form of reaction mechanism – SN1 or SN2 – takes place, is depending on the structure of the chemical compounds, the type of nucleophile and the solvent. Catalyst poisoning is the term for the strong chemisorption of species on catalytic sites which block sites for catalytic reaction. Poisoning can be reversible or irreversible. Fouling refers to a mechanical degradation of the catalyst, where species from fluid phase deposite onto the catalytic surface and in catalyst pores. Thermal degradation and sintering results in the loss of catalytic surface area, support area, and active phase-support reactions. Vapor formation means a chemical degradation form, where the gas phase reacts with the catalyst phase to produce volatile compounds. Vapor–solid and solid–solid reactions result in the chemical deactivation of the catalyst. Vapor, support, or promoter reacts with the catalyst so that an inactive phase is produced. Attrition or crushing of the catalyst particles results in the loss of catalytic material due to mechanical abrasion. The internal surface area of the catalyst is lost due to mechanical-induced crushing of the catalyst particle.